I am in the process of rebuilding PAiA 4700 modules for a customer and building some custom modules in this format as well. I also built a custom power supply for a new cabinet. I will be documenting the modules as I complete them and have the 4711 Mixer, 4720/A VCO, 4730 Multi-Modal Filter, and the 4740 Envelope Generator pages completed on my 4700 PAiA Modular Synthesizer Rebuild page. I'll be adding more as I complete them. Next in the queue is a Moog Ladder Filter using the YUSynth PCB. On your previous 2700 series restoration, and on some of these modules, you retain the vintage electrolytic capacitors. Any particular reason for not recapping all of them? I restore a lot of vintage equipment, including radios back to the early 1920s. Just because a capacitor is old doesn't mean it is bad. Personally I am not a fan of just recapping. I think it is a lot of needless work. If a capacitor has lasted 40+ years, it might outlast a replacement. For me, I don't recap until a capacitor has gone bad but of course I have the skills to repair and replace. In the case of this 4700 the customer does not and there is little incremental labor and cost involved. Interesting & sensible info Dave.... thanx. BTW.... how do you go about testing low voltage caps that are not visibly bad?? any preferred method? I understand that in theory. But the PAIA 2700/4700 boards probably are the most spacious and easiest to access PCBs in all of synthdom, and that many of these boards have four or less electrolytics on them means there is little incremental labor and cost involved to simply replace them all. Just trying to understand an approach that goes counter to what others have recommended and I have learned over the years. I am a hobbyist, not an engineer, so for me, it is probably better to just replace the electrolytics, especially in the power supplies. Excellent photos, and look forward to your continued postings on your restoration. So what is a good capacitor and what is a capacitor likely to fail. In 10+ years I will tell you which. I restore products from the 1940's on up at the vintageTEK museum. There are some years when the capacitors are just fine and other years when they seem to all be bad. Remember the issue with electrolytics on PC motherboards? I had some of those motherboards I just had to throw away. I can't tell you that the replacement capacitor will outlive the one that's already lived 40 years. Maybe it will, maybe it won't. Everyone has their own opinion. Mine is to replace parts that are bad, not to replace parts that are good. But, as I said earlier, I do my own replacements so it is no big deal. PAiA was not known for high quality so in this case for the customer I thought it the best solution. I'm just trying to explain my methodology. At the museum we use a B&K ESR capacitor meter and a curve tracer. I don't know the model of the B&K. At home I look at the circuit waveforms to see if there are any abnormalities. If there are, and I suspect a capacitor, I measure the value and then put it on a curve tracer to look at leakage at the working voltage. Of course one has to have a curve tracer. Having worked at Tektronix, I have one. When I did my 2700/4700 refurbishing project I decided to go less "original" and more minimalistic with my front panel aesthetics. But I do like the Moog meets PAiA vibe on your ladder filter! I also decided to use all 3.5mm jacks to make it easier to interface with my other modular gear. Nice work! Are the panels reproductions? I'm in the process of rebuilding some 4700/2700 stuff too at the moment- some of the panels look pretty harsh. Also, on the cap front, the latest (I think) Nuts and Volts has a project to build an ESR meter, it looks interesting. The panels on the PAiA nomenclated modules like the 4720, 4730, etc. are original. I made reproductions using FrontPanelExpress for the custom modules like the Keyboard, Power, Bias, and Glide. 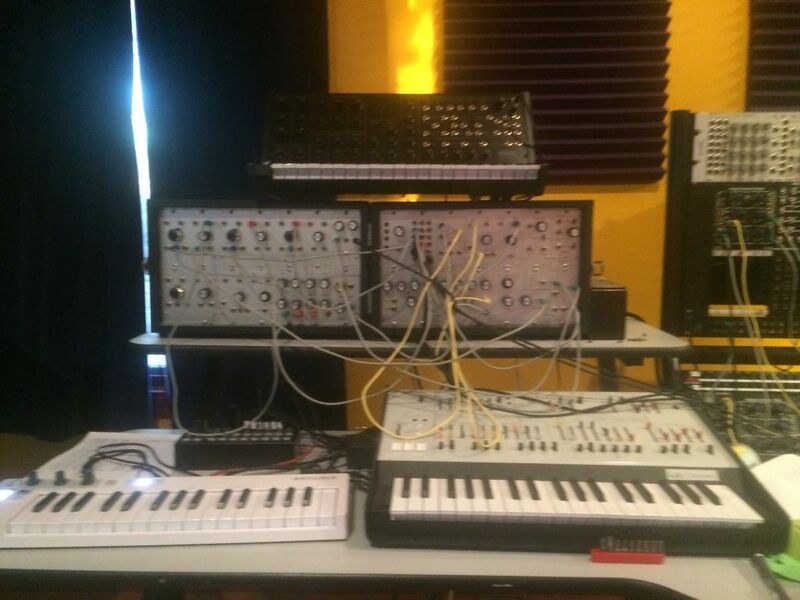 I have not yet made the Moog Ladder filter panel. Very cool! Here are some pics of my rebuild. Very nice Kyhotay, those panels will last forever. I like the precision dials on your four VCOs. Your 4700-PP2 patch panel - are the six jacks in each row connected together (passive, as in 2700 series) or are they buffered in any way? The 10-turn pots really help the tuning resolution plus they still look vintage à la the EMS VCS3 synth. The PP-2 jacks are just passively connected. Damn...I didn't even think about buffering! BTW, the bottom 3 jacks are RCA jacks. Why RCA jacks, you ask? Why to connect the CV and Gate output from my PAiA Fatman. Since it puts out Hz/Oct for its pitch CV, it interfaces with the 4720 and 4730 perfectly, plus you can add velocity control to any of the CV inputs! I've added a few more modules to the PAiA 4700 Modular Synthesizer Rebuild page including a 4710 Balanced Modulator and the 4780 Sequencer. I've scanned a few more documents as well which are much better quality than those on the PAiA site. The Sequencer was quite involved and was definitely not a beginners kit. Good job! 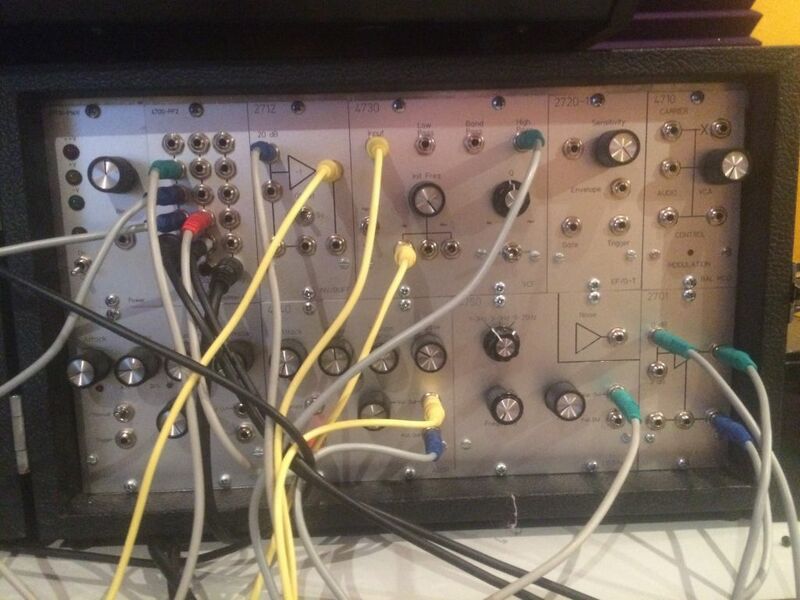 That sequencer was quite a module. Very weird stage pots; took me a few seconds to realize what I was seeing. Are they multi turn? 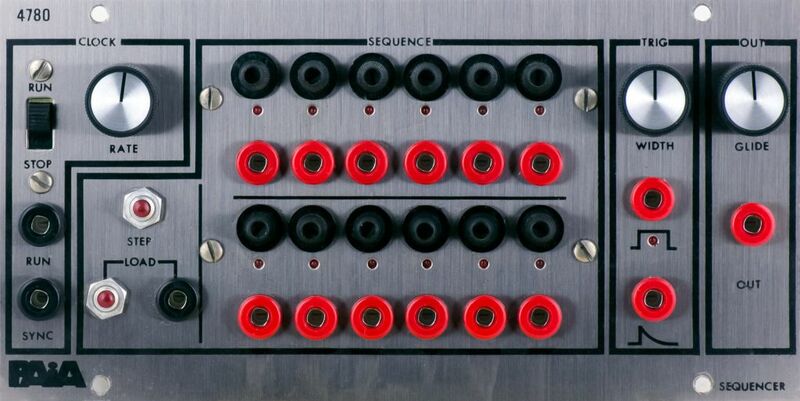 Yep, the sequencer had mu;ti-turn pots. If I remember correctly they were 20 turn pots. It took forever to tweak them in. Then (at least mine) didn't stay in tune for long periods of time. I just purchased a Shanghai Yihua V&A VA520B LCR meter which I really like. It was NOT easy to find but I eventually did. There are lots of low cost C meters on the market. I wanted one that went up to 100 KHz and didn't cost a lot. The tip pin jacks in your restoration - are they the traditional PAIA jacks, or have you "bananafied" them somehow? No, I simply replaced them all with banana jacks. The hole is the same diameter. This is really inspiring. I have my P4700/J in storage and I'd love to refurbish it to such solid working condition some day. John Simonton's kits and writing were my original inspiration to become an engineer and analog circuit fanatic. 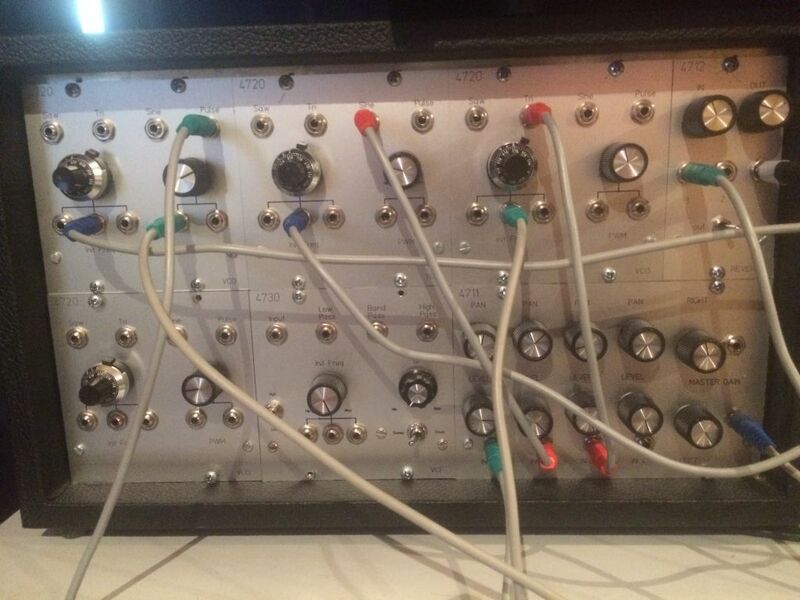 I just added a 4712 Reverb module to my PAiA 4700 Modular Synthesizer Rebuild page. That completes all the unique PAiA modules in this system that I can document. Most of the pages contain better scans of the build manuals than can be found elsewhere. The solder joints on those modules consistently look great. What is your approach with the soldering: do you remove old rosin, remove previous solder and redo almost all of the joints? Or just touch up the joints to reflow the old solder? Help me to be like you. Near the bottom of my Tips page I have a section on how I solder. One of the keys is washing the flux so for new DIY use solder with water-wash flux. Parts not flush with the PCB. This is critical on a single sided PCB as pressure on the parts on the topside will lift pads. Too much solder. Leads not clipped close to the PCB. Leads bent every which way on the solder side. Too much insulation stripped on wires so the insulation is not flush with the PCB. Too large of wire, or solid wire. On these PAiA boards nearly all of the above were true. The first thing I did was resolder the pads and pull all the parts flush with the PCB then cut off the leads flush. On pads with too much solder I removed some. I pushed wires through so the insulation was flush. I also removed the perf clips for power and wrapped the leads around the edge of the board so pulling on the wire would not lift the pads. Then I touched up any pads that weren't completely filled. I solder at 700F. Then I washed the PCB as most were covered with flux. I had to use acetone for that which sometimes leaves a film which I cleaned up with alcohol and then a final cleaning with acetone. I go through a lot of cotton swabs doing this. For a new build you just use the water-wash flux and they come out quite clean. One other tip ... I used lead solder. I don't like working with leadfree and it doesn't mix well with a board that has lead solder.